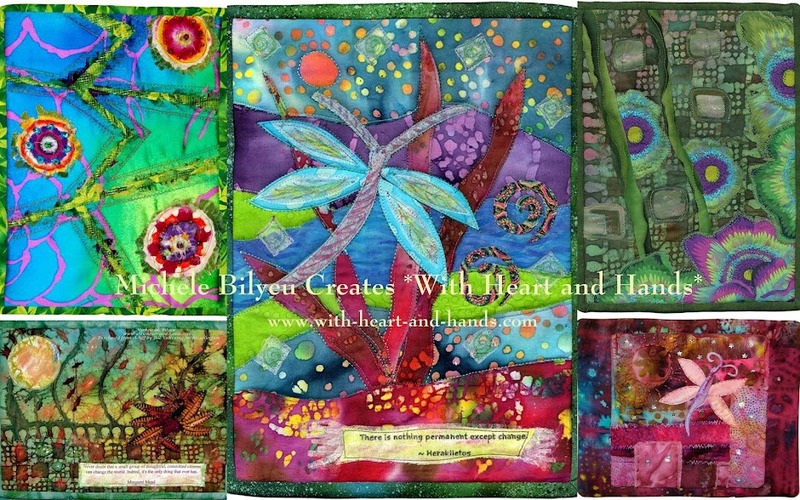 Materials/Techniques: Free-pieced cotton fabrics, ink jet photo printing of Laurel Burch quote on fabric, and glass beads. Liberated, freely pieced flying geese and curved seams to invite the 'freedom of birds in flight' and the 'mysteries of the earth' with Laurel Burch's cats and cat angels peeking out from everywhere. 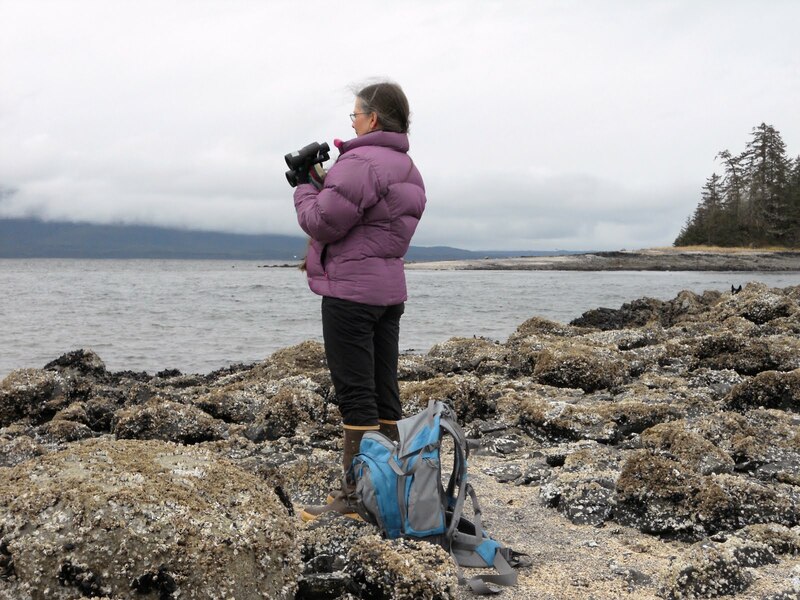 Artist Statement: When Laurel Burch left home at the age of 14, she had a paper bag of clothing and a rare bone disease that created over 100 fractures and resulted in her death in 2007, at the age of 61. We all face challenges in our life. May we learn to face them with the exuberant joy, passion for color and zest for life and living that Laurel Burch had. Dedication: Laurel's life filled us with color and joy and a passion for living. 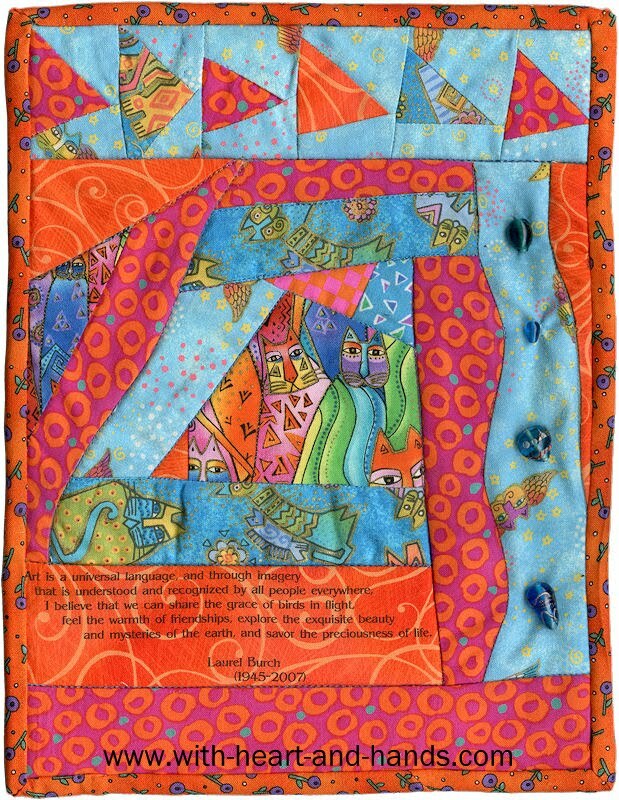 May this quilt carry those energies and fill your life with that magic, as well. 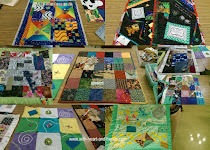 This quilt earned $50 for the AAQI and sold before it ever made it to the "quilts awaiting assignment page" or the "sale page" or the "Holding for Houston" page. I really enjoyed making this one with its bright, joy filled fabrics, the lovely quotation, and lots of liberated piecing and curves. It took me about 3 days as I worked through the piecing, photo printing and beads... and they were all great fun! I have one other 'Laurel' quilt awaiting assignment and photographing. The partner to this one is named is #7820 Laurel Points the Way...maybe she'll make it to Houston...or maybe she'll end up with her 'sister'....who knows? I'm having fun and they all go for such a wonderful cause. How wonderful! Laurel would be so proud. What a beautiful quilt and a beautiful dedication. Absolutely beautiful...who ever bought it...I know they will be forever in love with it. You always seem to be able to touch my heart. With your art, your stitching and mostly your words. Keep on! I also love Laurel Burch's art, and it seems to me to embody what she was all about. Your quilt expresses this wonderfully! That's lovely, Michele. Congratulations on a quick sale for a very worthy cause. Oh, Michele - this is fabulous! And a very fitting tribute to Laurel. I just love the new look to your blog. And I think your latest quilt for donation is just so unusual and fun and pretty. I am not surprised one bit that it sold right off. I love it! You probably know that I am a big fan of Laurel Burch designs. Hancocks of Paducah just had a number of her Christmas fabrics on sale for 6 dollars a yard so I bought a few of them. They are not so readily available here and never for that price. She had an amazing story and so sad to have lost her life too soon. I love your piece and am sure she would have thought it was gorgeous. You have created a lovely tribute to the memory of Laurel. I would love to see a pic of the one that's still in holding.....they don't show a pic, just the description. Is there a pic anyplace? I love this one and love Laurel Birch's fabrics too! Thanks! 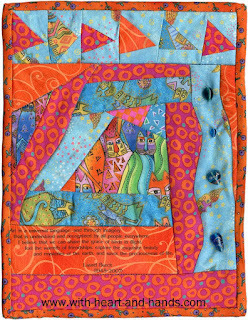 This is a beautiful quilt - so bright and joyful with its colors and free piecing.